InterContinental Hotel Group is currently running a Priceless Surprises promotion, which gives you a reward for each of your stays at an IHG property that you pay for with a Mastercard. The minimum prize for each entry is 500 IHG points, and the maximum prize is a million points or one of several trips including Paris, New York and Orlando. Besides being one of the better IHG promotions we’ve seen lately, what makes this special? Entries must be postmarked by February 15 and received by February 22. Note that you can computer-print the address label and return address label for the outside of the envelope, but the note card must be handwritten. Free nights might make this promo worth the effort. Since this entry method doesn’t require any IHG hotel stays, the cost incurred comes down to envelopes, address labels, index cards, stamps and your time. 94 stamps will cost you $46.06, and the rest of the supplies will set you back about $15. You can further your return by purchasing the supplies at an office store with your Ink Plus Business Card to earn 5x Ultimate Rewards. You can also find lots of stamp collections on eBay, which will save you about 20% on the postage cost. Assuming you have the worst luck possible and only win 500 points on each entry, you’ll still come out with 47,000 points. Top-tier InterContinental properties cost 50,000 points per night (where nightly room rates can be over $500), and IHG PointBreaks properties cost 5,000 points per night, so at the minimum you’ll have almost enough for a night at a high-end property or several nights at a PointBreaks hotel. In his latest monthly valuations, TPG pegs IHG points at 0.7 cents apiece, meaning your 47,000 points (at a minimum) are worth $329. It’s safe to say your $60 investment will be returned to you a few times over. My wife and I put 188 envelopes in the mail to win a haul of IHG points. 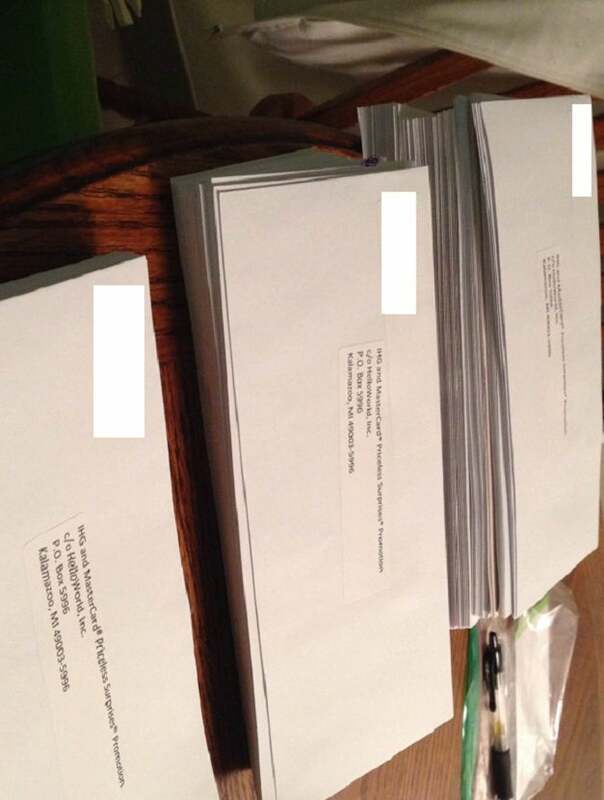 My wife and I just completed our 188 entries and put them in the mail. It took us each just over 2 hours to complete the entire process. I made sure everything on our note cards matched the information on each of our IHG Rewards Club accounts, and we each used our individual email addresses. I also have the handwriting of a four-year-old, so I slowed down a bit to make sure everything was legible. What do you think? Who’s headed out to buy index cards, envelopes, address labels and stamps?